Singaporeans hate being sick just about as much as Americans hate waiting in line. They will go to great lengths to avoid an illness. As you see in the picture above, they will wear surgical masks if they are feeling the slightest bit unwell. It always makes me giggle a bit when I see people wearing them on the street. It's like seeing a bunch of Asian surgeons running around Singapore in between their surgeries. Then came H1N1. Now this place is starting to look like one big hospital. They are freaking the hell out. They wear the masks all the time as if these are magic masks that will prevent the spread of swine flu. It all came to a head last week when one of the sweet Singaporean girls came into my cube. Singaporean: Megan, could you see if they sell N95 masks close to where you live? Me: Uh. I have no idea what that is. Singaporean: You know lah. The masks that you put over your face to not get sick. I'm going to the States for a visit soon and I need masks to take with me on plane. Me: (unsuccessfully holding back giggles) That's just silly. No, they don't sell those. Americans don't wear those unless they're a doctor, nurse or cleaning some really stank bathrooms. Singaporean: NO! I'm sure they ask me to have it on plane lah. I must find more masks. I am out lah. Me: (really unsuccessfully holding back giggles now) I highly doubt it. Sorry. I think you're on your own on this one. My father once told me that "tact" isn't my strong suit. I think I see what he means. I'm pretty sure I read somewhere before that those masks don't help with preventing catching an illness. The masks are more to prevent you from spreading something around. I'm one the biggest germ fearers around and even I think the reaction to swine flu is a little over the top. I blame the media. Surgical masks, the cheap kind, prevent droplets from getting past the inner membrane outward, so you're supposed to wear it when you're sick and you won't infect others. If you're not sick, and you wear one, and the guy next to you sneezes, time to start crossing fingers! 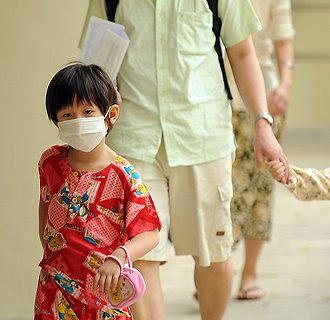 The N95 mask which the more kiasu Singaporeans (like my family!) are purchasing tend to be somewhat costlier; they're particulate respirators (that's the technical term) and block 95% of all particulate matter, down to the size of n microns (can't remember how many). These are used in hospitals for the really serious stuff, like the Sars and H1N1 outbreaks, and do prevent you catching germs - if they're fitted properly.